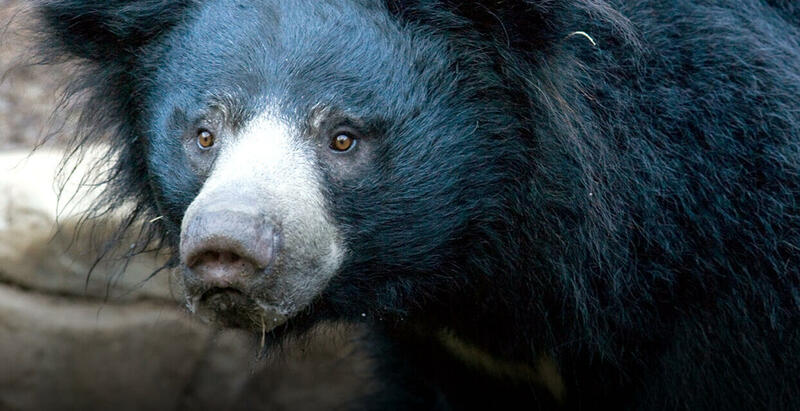 The sloth bear is in grave danger of extinction throughout most of its range. Since 1957, San Diego Zoo Global has bred 25 sloth bears of two subspecies, the Indian sloth bear and the Sri Lankan sloth bear. Together with our partners, we support conservation efforts by exchanging animals with other breeding institutions to maintain genetic diversity in the North American population. Understanding basic physiology and behavior of sloth bears is fundamental to conserving it, and involves creatively combining laboratory science with field techniques. Reproductive Sciences and Recovery Ecology researchers at the Institute have embarked on a long-term collaboration with Wildlife SOS, a non-profit organization working to protect and conserve the natural resources of India. Wildlife SOS has rescued nearly 400 bears from the “dancing bear” trade in India, all of which now reside in four rescue and rehabilitation centers. The presence and protection of these animals offers an unprecedented opportunity to study the little-known sloth bear. Our work will provide critical new information about the behavior and physiology of the sloth bear to better manage populations in zoos, rehabilitation facilities, and in the wild. Our behavioral work focuses on studies of well-being and temperament, social and reproductive behavior, and chemical and acoustic communication. Our reproductive studies are centered on estrous cycle hormone profiling, seasonality, physiology of ovulation, and identification of pseudo pregnancy. The large population of sloth bears at Wildlife SOS will contribute to an unprecedented dataset that includes weights and measurements, growth rates, and claw and hair growth as indicators of dietary health, and other life history variables.